As communists, we stand for an independent, united and self-reliant Britain run by the working class – the vast majority of the population. If that’s what you want too, then come and join us. All our members are thinkers, doers and leaders. All are expected to work to advance our class’s interests. All must help to develop our understanding of what we need to do and how to do it. What do we do? Rooted in our workplaces, communities and trade unions, we use every opportunity to encourage our colleagues and friends to embrace the Marxist practice and theory that alone can lead to the revolution that Britain needs. Marx’s understanding of capitalism is a powerful tool – the Communist Manifesto of 1848 explains the crash of 2007/8. Either we live in an independent Britain deciding our own future or we become slaves to international capital. Leaving the EU is the first, indispensable step in the fight for national independence. We have no paid employees, no millionaire donors. Everything we do, we do ourselves, collectively. That includes producing Workers, our free email newsletter, our website, pamphlets and social media feeds. We distribute Workers, leaflets and pamphlets online and in our workplaces, union meetings, communities, market places, railway stations, football grounds – wherever workers are, that is where we aim to be. We hold regular public meetings around Britain, in-depth study groups and less formal discussions. Talking to people, face to face, is where we have the greatest impact and – just as importantly – learn from other workers’ experience. We are not an elite, intellectually superior to our fellow workers. All that distinguishes Party members is this: we accept that only Marxist thinking and the organised work that flows from it can transform the working class and Britain. The real teacher is the fight itself, and in particular the development of ideas and confidence that comes from collective action. 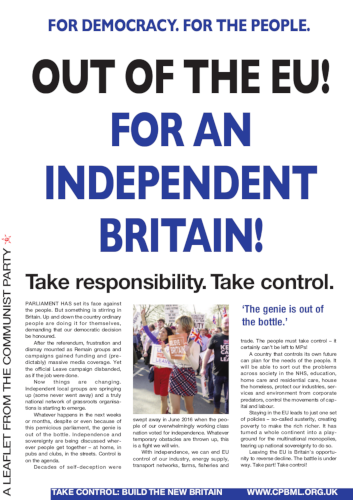 • See also British Independence and the Working Class, the political document agreed at the Party’s 18th Congress, held in London in November 2018. The document is also available as to download as a PDF.